Up to 30 percent of child poisonings involve a grandparent’s medicine. Half of the nearly 2 million calls to poison control centers in 2017 were for exposures and ingestions among kids under age 6. For every 10 poison exposures in children under age 6, approximately nine occur at home. 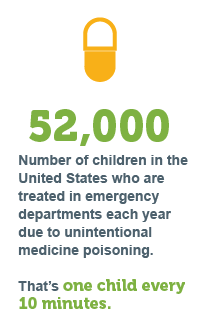 Children under age 6 are at greatest risk for unintentional medicine poisonings. Safe Kids works to decrease preventable medicine-related injuries and deaths to young children by promoting important messages in the community and in media. Safe Kids educates families about responsible storage, dosing and disposal of medicines. At the local level, our Safe Kids network connects directly with children, parents and caregivers by organizing medicine safety classes, hosting interactive community events and distributing educational materials and tools. We offer a variety of resources to families and our network on medicine safety. These resources include research, tip sheets and checklists, videos and a medicine safety schedule to help keep track of children’s medicine. Safe Kids conducts research to study the attitudes and behaviors of parents and caregivers around medicine safety. These reports enable Safe Kids to shape a powerful communication message to the public and help inform programmatic decisions. We work to support full funding for the Poison Control Center network, an essential component of our health care systems. This system helps keep our children safe from medicine poisoning; reduces medical costs by fostering more efficient and effective care; and can cut the length of a hospital stay in half, from 6.5 days to 3.5 days More broadly, we identify emerging trends, such as vaping and the child safety implications of legalizing recreational marijuana, and educate our coalitions and ultimately legislators about the impact of these trends on child safety. We also advocate for legislation supporting consumer/parental awareness around the issue of child-resistant packaging. And we provide our coalitions with the tools to influence policy on these and other child-safety related issues in their localities and states. This program is made possible with support from Johnson & Johnson Consumer Inc., a division of Johnson & Johnson. Johnson & Johnson Consumer Inc. began a partnership with Safe Kids in 2012 to raise awareness about safe medicine practices. We also offer tools to teach and remind families about unintentional medication poisoning.